Welcomet to visit kalinu technology website, we are the professional manufacturer of digital microscope and microscope camera. 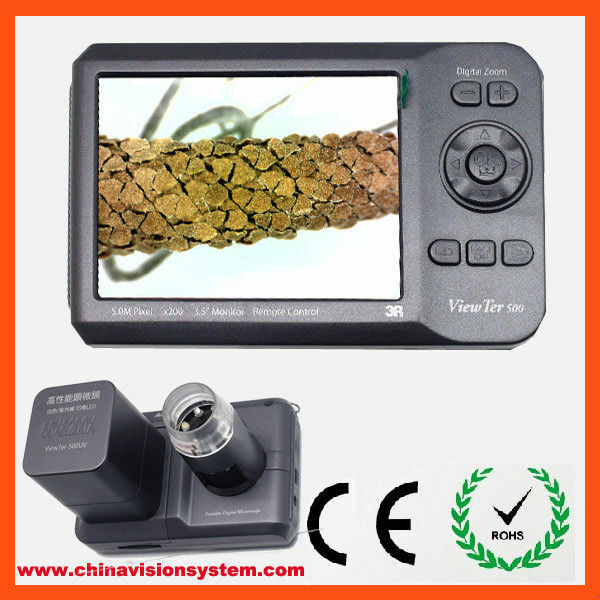 The model KLN-MSV500 is the newest model as portable video microscope with LCD screen. The magnification is much larger than KLN-MSV330. The optical magnification is near 200x without any digital zoom. There is built-in 4x digital zoom, so the max magnification is near 800x. 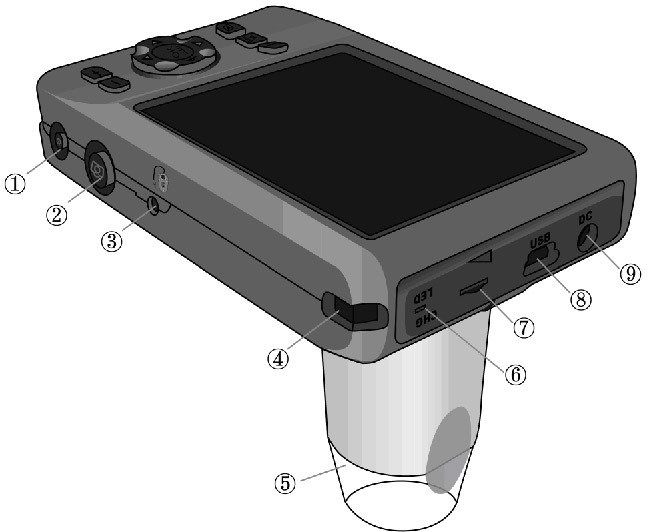 The KLN-MSV500 portable microscope is an exciting new product which has a 5 megapixel sensor and detachable interchangeable Auxiliary Focus Caps. It is a true portable microscope, allowing you to observe micro-object and record every detail and providing you an experience you never had. 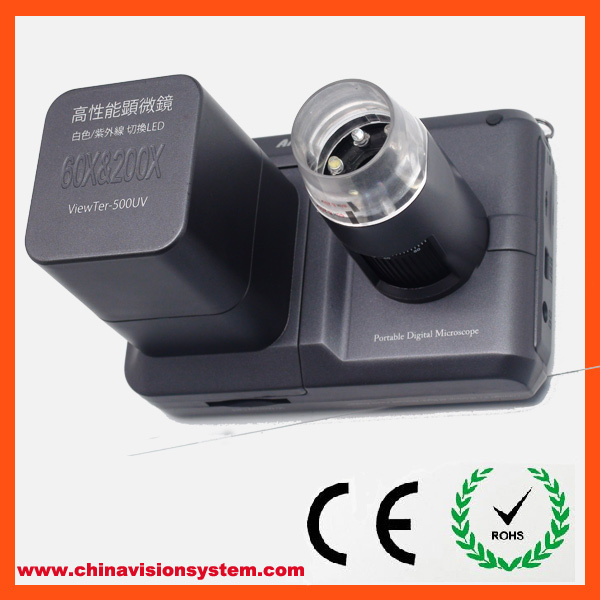 It can magnify up to 200x magnification with a resolution of up to 2560x1920. With such magnification and resolution, you will not miss any important details. The KLN-MSV500 includes convenient shutter key and adjustable interchangeable brightness 4 x white LED and 4 x UV LED as illumination, which allows you take image, record video and adjust LED brightness easily. Even more, your iScope-MSV500 Portable microscope camera comes with professional iScope Pro software that allows you to carry out calibrating and measuring on the captured images. 1 second for power on, or 2seconds for power off. In video playback mode, press this key to start or pause the video playback. 3.Extending Shutter Connector: Connect with the wired controller of extending shutter, which has 3 keys, and then press individually these keys to perform the same function as Shutter Key/Mode switching/LED switching. 4.Strap Hole: For holding camera strap. 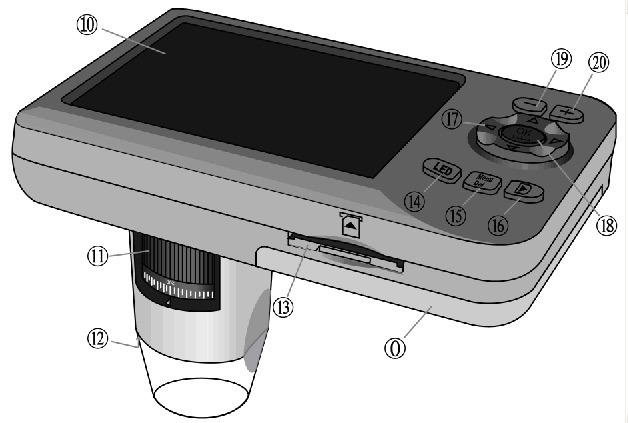 5.Auxiliary Focus Cap: Assists you in performing the microscope at a fixed magnification. 6.Charging LED: Under Charging---RED LED is on. Finished Charging---BLUE LED is on. 7.Illumination Adjustment Wheel: For adjusting the illumination brightness. 8.USB Connector: You can transfer images or videos when connecting to PC through an USB cable. 9.DC 5V Charging Connector: Connects with AC adapter for charging Li-ON Battery. 10.LCD Monitor: For displaying image or video. 11.Focus&Magnification Adjustment Wheel: For adjusting optical focus and magnification. 12.LED Illumination: Providing light source for the camera. 13.SD Card Slot: For inserting SD card in the camera. 14.LED Illumination Switching: Press this key to switch different types of LED illumination: UV LED or white LED. 15.Menu/Del: It is a dual-functions key, which is “Del” key in playback mode to rotate/ protect/delete file; or as “Menu” key in other modes to enter setup operations. 17.Multi-Selector: For navigating through the camera menus or moving cursor left/right/up/down at zoom in or out of image. 18.OK/Scale: It is a dual-functions key, which is “OK” key in menu operation; or as “Scale” key for scale display in shooting mode. 19.Zoom-Out: Press this key to zoom out the image or video. 20.Zoom-In: Press this key to zoom in the image or video.